The differences between a typical Western diet and a high quality diet is vast. The typical Western diet is characterized by high levels of refined and processed foods, is absent of meaningful levels of vitamins, minerals and fibre, and is also deficient in essential fatty acids and high quality protein sources. The characteristics of the typical Western diet, particularly its high sugar content, give it drug-like properties, and addiction to the refined foods is evidenced in the nutritional literature. Switching to a high quality diet can therefore require a seismic shift in the eating habits of the individual, and this is not alway easy when addiction to particular foods is present. The best way to adopt a high quality diet is therefore to take smaller steps towards healthier eating over time. Some of these step can be surprisingly easy and when added together can cause significant improvements in health with little effort. Creating smaller goals and achieving them one step at a time is therefore a better strategy than making sweeping changes. For example, the inclusion of green tea to the diet is a very easy step to take. Not only is green tea a healthy foods that shows benefits against cancer and cardiovascular disease, it is also a weight loss food. Evidence supports a role for green tea in weight loss and this in itself provides significant health effects. Also, as green tea is not drunk with sugar, switching to green tea can also benefit health by lowering sugar intake. Another easy step to take toward better health is to take a multivitamin and mineral formula supplement. Although such supplements should never be relied upon to obtain nutrients, they can be a useful adjunct to a healthy diet. For those not currently eating high quality foods, adding a high strength multivitamin and mineral formula to your nutritional intake can help rebalance vitamin and mineral levels and allow the repletion of vitamin essential nutrient stores for certain nutrients. However, minerals such as selenium, zinc, chromium and iron for example may take some time to build up to adequate levels in tissues. Fruits and vegetables are an important part of a healthy diet, but switching from a sugar laden diet to a fruit and vegetable based diet can be difficult. lowering sugar levels gradually while increasing the dietary intake of dried fruit can allow a more gradual adjustment period for those that find the thought of complete abstinence of sugar difficult. Dried fruit also contains the original fibre from the whole fruit and this can increase the fibre content of the diet considerably. At the same time, substitution of traditional sucrose or table sugar for alternative forms of sweeteners can be useful. Molasses and honey are both sweet, but both contain nutrients that are beneficial to the health. While they should not be over consumed, they can provide a useful tool during any transition to a healthier eating plan. Another simple step to better health is to consume more water. Often thirst is mistaken for hunger and drinking more water for some people can be a successful strategy to maintain more control over food intake. Sugar cravings are relatively common and can occur for a number of different reasons. Certainly sugar cravings can occur following exercise, and such cravings are the natural response to physical activity that can deplete the glycogen stores of the skeletal muscle. Physical activity also increases the sensitivity of skeletal muscle to insulin. These factors cause blood sugar to pass into the muscle and lowering blood sugar levels. This causes a feedback signal to the hypothalamus to stimulate the consumption of carbohydrate foods in order to both maintain blood sugar and to allow the subsequent resynthesis of glycogen. Such cravings are not detrimental because they are a requirement of normal blood sugar regulation and result in the maintenance of glycogen stores. However, some individuals develop sugar cravings without the performance of physical activity. Such people often find their sugar cravings are for particular low quality foods and these foods may as a result be over consumed leading to weight gain. L-glutamine is an amino acid that has shown some success at treating these sorts of idiopathic sugar cravings. Only about 40 % of L-glutamine is a is absorbed in humans due to most being used by enterocytes as a source of fuel. Following absorption, plasma levels rise as the remaining L-glutamine passess into the blood. The exact reason why L-glutamine is effective at preventing sugar cravings is not known, but may relate to the ability of L-glutamine to be deaminated and the carbon skeleton used as a precursor for gluconeogenesis. In this way L-glutamine allows the production of new glucose in the liver, which enters the circulation and raises levels of blood glucose. As blood sugar levels rise, the hypothalamus down regulates the cravings for sugar. In addition, L-glutamine may enter the central nervous system directly where it functions as a neurotransmitter. This may decrease the cravings for sugar directly. L-glutamine is safe, and doses of around 2 to 5 grams per day may reduce sugar cravings. The aetiology of depression is complex. The reason for this may be that depression is caused by different things is different people. The traditional view of depression is that it s caused by a deficiency of serotonin in the brain. Modern medical treatments as a result centre on the use of selective serotonin reuptake inhibitors (SSRIs). These drugs prevent the reuptake of serotonin from the synaptic gap back to the synapse of the afferent nerve and this increases the amount of serotonin in the synaptic space. Placebo controlled studies however show that these drugs are really no more effective than placebo treatments for depression. In fact in many people SSRIs have negative effects and can increase the likelihood of suicide or the development of worsening depression. Part of the reason for this may be that serotonin deficiency is not the cause of depression in many individuals, and the fixation on drugs to increase serotonin levels has been a short-sighted exercise in barking up the wrong tree. More recently a new class of drugs called the noradrenaline reuptake inhibitors (NRIs; sometimes called adrenergic reuptake inhibitors ARIs) have been developed. These new drugs are based on the theory that in some individuals, a deficiency of noradrenaline, adrenaline and dopamine (catecholamines) might be the cause of depression. This is in effect a tacit admission by medicine that their first attempt might not have been a good attempt. The development of NRIs is not a surprise to nutritionist who have long suspected that depression may result from a widespread imbalance in a number of neurotransmitter systems. The nutritional approach to treating depression is far more effective than the medical approach because it takes a holistic view and does not attempt to target a single neurotransmitter subgroup. Instead optimisation of all neurotransmitter groups, using a combination of high quality diets, isolated amino acid and exercise aims to produce a synergistic rebalancing within the central nervous system. For example, exercise is perhaps the single most beneficial treatment for certain forms of mild depression. Not only is the physical activity useful, but the social aspect of performing exercise is highly underrated. The use of single amino acid treatments in nutritional therapies has centred on the use of L-tryptophan and its metabolite 5-hydroxytryptophan, as well as L-tyrosine. These amino acids are beneficial because they are used by the brain to manufacture serotonin and the the catecholamine neurotransmitters noradrenaline, adrenaline and dopamine. They are superior to drugs because they supply substrates for neurotransmitter synthesis before the rate limiting step in the synthesis pathway. In this way the brain's own natural feedback inhibition is still able to prevent excessive production of single neurotransmitter types, something which a drug treatment bypass. High quality diets improve health generally and as physical health improves mental health often concomitantly follows. L-phenylalanine is an essential amino acid required for the synthesis of proteins. In addition, L-phenylalanine is the substrate for the formation of the catecholamine neurotransmitters and hormones. The catecholamines are adrenaline, noradrenaline and dopamine, and in the brain they play an important role in motivational behaviour. Low levels of adrenaline, dopamine and noradrenaline are associated with anxiety and depression. Stress is able to deplete the catecholamine neurotransmitters because they are required for the adaptation stage of the stress response. Supplemental L-phenylalanine has been shown to increase brain levels of phenylalanine, and this in turn increases brain levels of the catecholamines. L-tyrosine, a metabolite amino acid of L-phenylalanine has been shown to reduce the stress effects of battle and has been more heavily researched that L-phenylalanine, but both have similar effects in the central nervous system. The normal dose is 500 mg three times per day on an empty stomach. Amino acids can be found in both L- and D- forms, which are stereoisomer. Usually, only the L-forms of amino acids are used by humans. L-phenylalanine is the form of the amino acid that is required for protein synthesis and other amino acids must also be in their L-form (e.g. L-tyrosine, L-glutamine, L-serine, L-methionine). However, D-phenylalanine is an exception as it appears to provide some physiological benefits with regards to pain. D-phenylalanine is absorbed much like L-phenylalanine, where it passess in to the brain. Here it inhibits the breakdown of the natural opioids in the brain, the enkephalins. Thus D-phenylalanine has a pronounced pain relieving effect. D-phenylalanine in not available as a supplement, but DL-phenylalanine, a racemic mixture of the two stereoisomers, is available. Taking DL-phenylalanine provides the D-phenylalanine necessary to have the pain relieving effects. As with L-phenylalanine, doses for pain relief are around 500 mg three times per day, taken on an empty stomach. The quickest way to lose weight is to starve yourself. Fasting is the quickest weight loss strategy because it causes a loss of muscle mass, glycogen, water, bone density and body fat, and this provides rapid weight loss. However, the weight loss although rapid initially, does not continue for long because the hypothalamus soon initiates countermeasures to increase the efficiency of energy metabolism. These countermeasures include a huge increase in appetite, a down regulation of resting metabolic rate and an inhibition for the motivation and fuels for physical activity. The loss of bone and muscle mass also makes long term fasting dangerous and unhealthy, because losses of lean mass are associated with mortality. After fasting, the next quickest way to lose weight is a very low calorie diet, and the the principles at work are the same as with fasting, but the weight loss is not quite so extreme. Both fasting and very low calorie diets are poor strategies for long term weight loss as they cause permanent damage to energy metabolism that increases the risk of future weight gain significantly. So fasting and very low calorie diets are detrimental to the health. Perhaps the question should therefore be rephrased. Perhaps instead we should ask, not what is the quickest way to lose weight, but instead what is the best way to lose weight? In this regard many people assume that calorie restriction, often in combination to aerobic exercise, the the best way to lose weight. However, evidence from the literature does not support this contention. In fact, calorie counting although not as severe, still leads to the same ill health as fasting and very low calories diets, but with the former, the journey to the grave takes longer. In other word, the weight loss includes muscle and bone loss and this induced permanent damage to the resting metabolic rate and causes significant health problems. High quality diets address the problems of calorie restriction because they address the cause of the weight gain, which is insulin resistance caused by low quality foods. High quality diets lower insulin levels, and as insulin is a brake on fat oxidation, they increase body fat oxidation, ultimately leading to effortless fat loss, without lean tissue losses. The walnut tree (Juglans sp.) is a large deciduous tree which originates from south eastern Europe and western Asia. It has been introduced to many countries, including Britain, where it can be found growing wild, or is often grown for its fruit or ornamental value. The leaves of the walnut three are ovate to elliptical alternate green leaves, and the tree contains a smooth bark. In the late spring, the walnut tree produces male catkins and female flowers, the latter being small and inconspicuous. Fertilisation produces a green succulent drupe that contains a hardened nut that we know as the walnut. The outer green pericarp of the fruit and the leaves can both be used medicinally. The leaves and fruit contain tannins, organic acids, essential oils and bitter compounds such as juglone. The medicinal properties of the fruit and leaves include anti-inflammatory, antispasmodic and sedative properties. This makes extracts of the fruit and leaves useful in treating digestive disorders of the stomach and intestines. The leaves and fruits can also be used topically on the skin. Figure 1. The walnut tree. Picture taken from: Stodola, J., Volak, J. and Severa, F. 1984. Illustrated Book of Medicinal Herbs. Octopus Books, London. First edition. 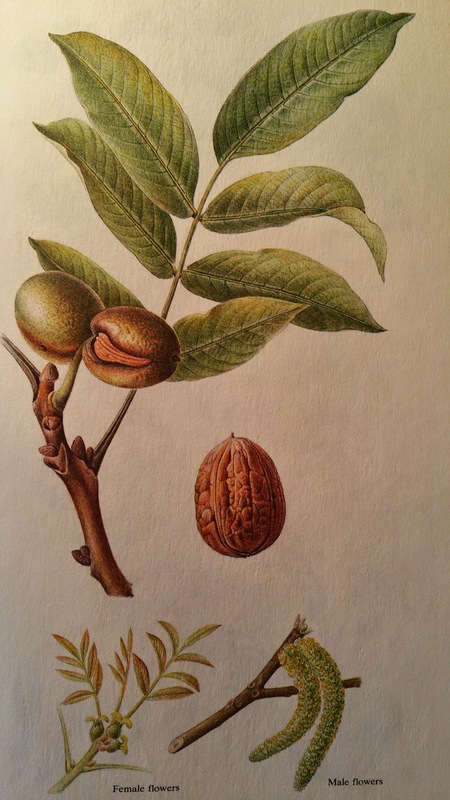 The nut of the walnut tree also possesses medicinal properties. The nut is a rich source of protein and fibre, and is also rich in the essential fatty acid alpha linolenic acid (ALA, C18:3 (n-3)). Alpha linolenic acid is essential to human health because it is used to synthesise a range of short lived chemicals called eicosanoids that regulate cells function. The eicosanoids synthesised from alpha linolenic acid have particular effects against inflammation, platelet adhesion and may be required to enhance immune function. The polyunsaturated fats in the walnut seed constitute a large proportion of the energy it contains, but much of this energy is never absorbed in humans. This is because the nutrients in the seed are contained within tough parenchymal cells walls that are indigestible to human enzymes. Most cells that survive the crushing action of the teeth are therefore immune to digestion and as such do not contribute to the energy needs of the individuals. The walnut seed also contains ellagic acid, along with other phytochemical antioxidants, in addition to high concentrations of vitamins and minerals.